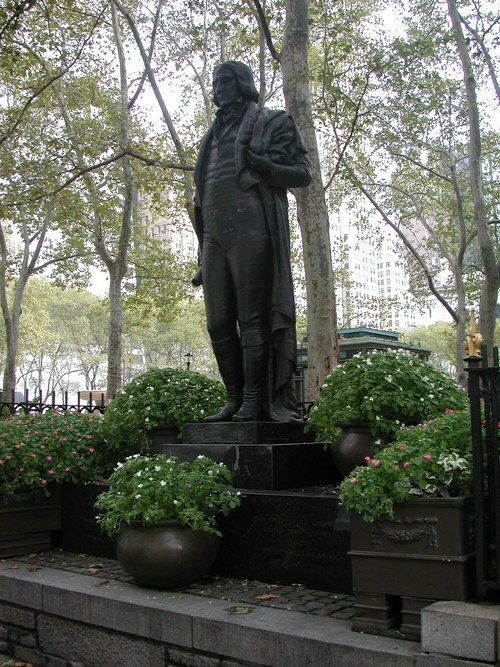 BPC archivist and historian Anne Kumer sheds light on one of Bryant Park’s many monuments. You may have noticed a stately looking fellow watching you as you walk by Bryant Park on 6th Avenue between 40th and 42nd Streets. His full name is José Bonifacio de Andrada e Silva, also known as the Andrada monument. Sculpted out of bronze with a granite base by artist José Otavio Correia Lima, the Andrada monument was dedicated on this day in Bryant Park fifty-five years ago, April 22, 1955. Originally located at the northwest corner of Bryant Park, Andrada was moved to his current location on 6th Avenue in the early 1990s as part of park renovations. Andrada (June 13, 1763 - April 6, 1838) was a naturalist, Brazilian statesman, professor of Geology, and poet. He was primarily known for his support in Brazilian independence and was appointed its Prime Minister following the country’s secession from Portugal. As a naturalist he discovered four minerals, including one named in his honor, andradite. Each year in September, the Consulate General of Brazil in New York pays tribute to Andrada and Brazilian Independence Day with a small commemorative ceremony at the site of the monument.